When Helena Zhu, a third-year student studying civil engineering, completed a two-month study-abroad program in Madrid, Spain, at the Universidad Pontifica Comillas, she wondered what to do with the final month of her summer holiday. “It was too expensive to go home,” says the Guangzhou, China, native. “And I still had time left on my European Union (EU) visa, so it didn’t make sense to go back to New York early.” Instead, Zhu decided to buy a ticket to Thessaloniki, Greece, to volunteer with a Greek nonprofit group, Emergency Response Centre International (ERCI), helping it design a study center for refugees living in that city. Zhu’s arrival in Greece wasn’t by chance: she had taken Professor Toby Cumberbatch’s Engineering Design and Problem Solving course (EID 101). In that course, Cumberbatch described his work in Ghana designing temporary shelters for refugees there. Zhu was excited by the possibility of applying her knowledge to solve immediate, critical problems. She had been charting the refugee crisis— almost 900,000 people arrived in Greece in 2015 alone—and had been thinking about how she could help when the opportunity with ERCI arose. But upon her arrival in Thessaloniki, she discovered that ERCI had to postpone plans for the study center; the group hadn’t yet secured permission for its construction. She realized she would have to find another way to help. She paid for a plane ticket to the island of Lesbos, where thousands of refugees have landed since 2015 because of its proximity to Turkey. There, Zhu spent a month working eight-hour shifts as a lookout, scanning the Aegean for signs of the small rubber dinghies carrying refugees from Syria, Libya, Afghanistan, countries throughout Central Africa and Iraq. Once on Lesbos, Zhu was assigned to one of two lookout posts that ERCI maintains on the southern coast of Lesbos. There she met volunteers from around the world, including a young man from Sweden who had already spent nine months on the island helping shepherd refugee boats to shore. Although Lesbos is only about 23 miles from Ayvalik in Turkey, getting to Greece—and therefore the European Union—is treacherous as much for political reasons as for physical ones. To start, the EU and Turkey came to an agreement in March 2016 that any refugees found crossing the Aegean would be sent back. Zhu witnessed the agreement’s results first hand: “If the EU catches a boat, they’ll send them back so a lot fewer are coming. So many have been turned back. We heard it on the radio as we were looking out for boats.” What’s more, rescue boats sponsored by private organizations cannot pick up or rescue refugees without risking being charged with human trafficking—a fate that befell two Danish and three Spanish volunteer lifeguards, well known in the area as active rescuers. They were arrested while out on patrol and are still awaiting trial. The EU-Turkey agreement also caused more people to risk a crossing during bad weather: while the chance of capsizing is greater, choppy waters make detection by the Greek Coast Guard more difficult. That might explain why in Zhu’s month on Lesbos, she took part in only two rescues. They occurred on August 12 within six hours of each other on a night when the waters were particularly rough. She was working the night shift from 12 to 8 am with three other people: a medic, a Farsi translator and a Greek woman on her first day at Campfire, the code name of ERCI’s northernmost lookout spot. The group, primarily West African and Pakistani men, were panicked. Eighteen people in total came ashore, including one pregnant woman and a very ill man. Some had life vests; others didn’t. In English, they told her that two people had fallen into the water. She used the ERCI’s group message board to report the missing people and request help for the men and women who had just landed on shore. “The whole team woke up, they drove here, and they contacted the Hellenic Coast Guard so that they could pick the refugees up with a bus, and take them to Camp Moria. That’s where everything is processed on the island,” she recalls. In fact, Camp Moria was the site of a devastating fire just one month later (see sidebar). 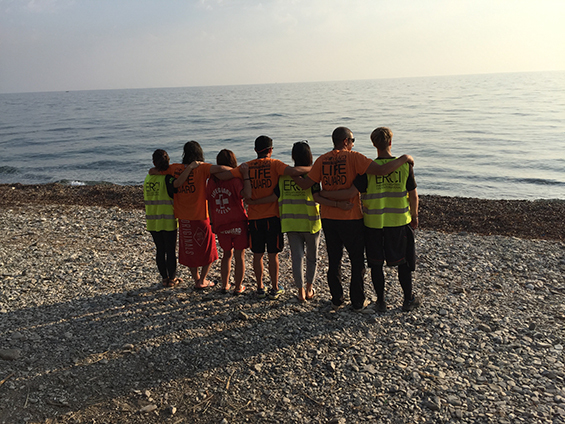 Finally, at about 6 am the crew at Campfire got good news: Frontex was the first to reach one of the missing men; ERCI’s boat located the second. They had survived more than three hours in turbulent water. The next night, Zhu worked the same shift, from midnight to 8 in the morning. She and the three other volunteers were about to leave Campfire as their shift was coming to a close. During one final scan of the horizon, a young man from Spain, who was working his very first shift, thought he saw something far in the distance, so far, in fact, that when the others looked, they weren’t quite convinced. Nonetheless, they alerted ERCI, and one of its boats went out to investigate: a rubber dinghy filled with people was making its way across the Aegean. Just over 24 hours since the last rescue, the group prepared for another. It asked its headquarters to bring blankets and clothing for the incoming group, who would need dry clothing after the crossing. The Swedish volunteer asked Zhu to videotape the rescue; ERCI likes to keep records of their rescues in case documentation of their work should ever be needed. In the meantime ERCI’s vans arrived, filled with boxes of clothing. Volunteers gave out blankets and clothes to the refugees, providing impromptu dressing rooms for the newly arrived women. Separated family members found each other, including the girl who had clung to Zhu. 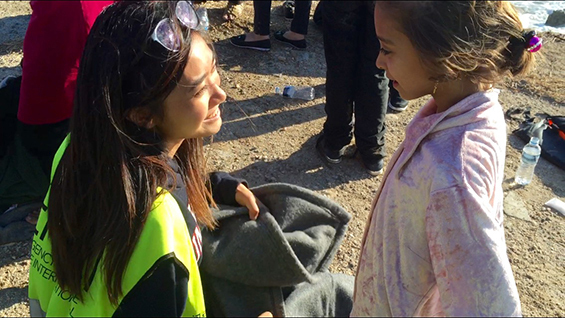 That was the last rescue Zhu witnessed in her month on Lesbos, but a few months later, the number of refugees attempting a similar route to Europe rose. The agreement between the EU and Turkey was disintegrating; the Greek Coast Guard often chose not to stop the makeshift boats. The last time she saw some of the men, women and children who had arrived during those two rescues, they were led onto a bus taking them to a refugee camp; Zhu recalls a Coast Guard member shoving a man forward, hurrying him to an unknown future. Since Zhu’s time on Lesbos, circumstances have deteriorated further. To begin with, 30 percent of Camp Moria, the central camp on the island, burned down on September 20, leaving 4,400 refugees without shelter, including approximately 100 unaccompanied children. While there were no fatalities on that occasion, a month later another fire in the camp caused by an explosion of a portable stove killed two people. 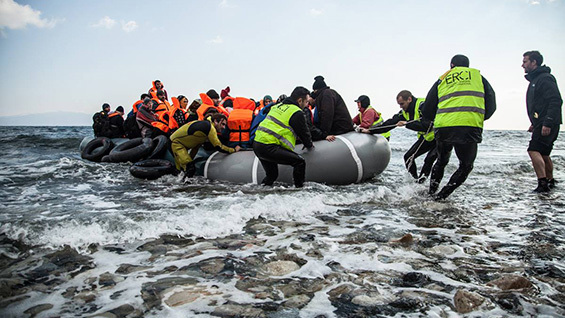 At the same time, more migrants were arriving, most trying to escape the violence in Syria. At the beginning of 2017, Germany vowed to return new asylum-seekers to the first EU country they entered—in many cases, Greece. In addition, residents of Lesbos, already hard-hit by the Greek economic collapse, have lost much of the tourist-driven work they count on, due to the refugee crisis. Making matters even more complicated, there were more than 80 aid groups operating on Lesbos in addition to rescue teams formed by Lesbos natives, many of whose ancestors had themselves escaped Turkey by boat during the 1920s. While the number of people dedicating themselves to helping newly arrived refugees was heartening, the municipal government was concerned that having so many groups, particularly those that failed to register with the local government, added to the chaos instead of relieving it.